Additionally, many are discharged from an institution(hospital,jail, mental health facility, with no resources to obtain housing. Q: What’s being done now to address homelessness in our community? 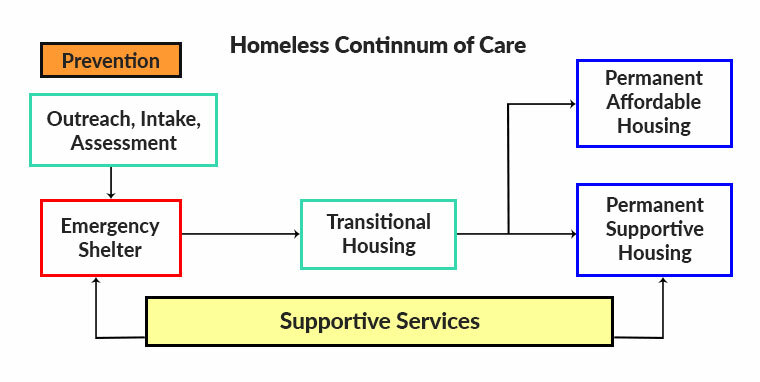 Homeless services in Washington, DC are conceptualized as a continuum of care: a comprehensive and coordinated housing and service delivery system. This framework helps our community provide a balance of emergency, transitional, and permanent housing and critical services to successfully support families’, and individuals’ transition out of homelessness. Prevention services are also a critical component of the continuum of care. Although resources have increased over the past decade, significant gaps in services for homeless people remain. Q: Where can I find additional resources on homelessness? Q: How do people become homeless? Homelessness is primarily caused by poverty and the lack of affordable housing; the current levels of housing costs, coupled with low-wage jobs and the economic downturn, push even the working poor out of their homes. Q: What is affordable housing? Housing and Urban Development (HUD) notes that the generally accepted definition of housing affordability is no more than 30 percent of monthly income going toward housing costs. Families or individuals who pay more than 30 percent of their income for housing are considered “cost-burdened” and can have difficulty affording necessities such as food, clothing, transportation, and medical care. The lack of affordable housing is a significant hardship for low-income households and can prevent them from meeting their other basic needs, such as nutrition and health care, or saving for their future.